If I had a time machine I’d go back to July 27th, 1984, and see Purple Rain in the theater. It’s one of my favorite movies. I’ve seen Purple Rain more times than I can count and every time I have a giant smile on my face. It’s not perfect. I recognize that some portions of the movie are VERY dated (which is part of its charm) and it has its problems. It won one Oscar for a now defunct category, but besides that the problem with saying Purple Rain is one of the greatest movies ever made is that it's not supported by any facts except my absolute love for what is on the screen. The facts are that it is not one of the greatest movies ever made, but I can prove something to you without a doubt: Purple Rain is one of the most unique and special achievements in the history of film, one that we will probably never see again. When putting Purple Rain into a modern day context, it is an amazing accomplishment that it ever even got made. While Prince is the entire reason Purple Rain exists, he is also one of its biggest hurdles. In early '80s Prince was starting to cross over from being a musician for mostly African-American audiences into mainstream music culture. He was riding high from the 1999 tour, and inspired by a few overlapping tour dates with Bob Seger, was looking for a platform to debut a more “rock” sound. With the overwhelming success of Michael Jackson’s Thriller, Prince spent the better part of a year writing down ideas for a movie starring… him. That’s right. A musician with absolutely zero acting experience wanted the lead in a feature length movie to catapult him to superstardom. Adding onto Prince’s lack of acting experience was the problem that Prince doesn’t do interviews. For a 15 month window surrounding the theatrical release of Purple Rain, Prince did exactly zero interviews. Just think about that for a second. In 2016, someone like Taylor Swift is in a movie and does not do a single interview in promotion. With the backing of Warner Bros., the producers set out to find a director to solidify a script from Prince’s notes. They found Albert Magnoli, a rookie director who at the time was literally right out of film school. With the director and star taken care of, they set out to fill the other two important roles in the movie: Prince’s love interest and the movie's antagonist. For the love interest, they cast Apollonia Kotero, a stunning woman who has more acting experience than Prince but that’s not saying much as she has had a background role in two movies and appearances on a few TV shows, but nothing significant. 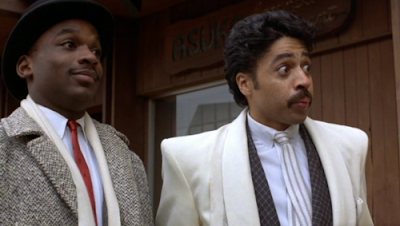 To balance out the three most important roles, the producers hired Morris Day as the villain, another musician on the rise but, again, no acting experience. Armed with a seven million dollar budget, Albert Magnoli set off with three actors with little to no experience and a script made up of notes from Prince to shoot a feature length version of Thriller during the winter in Minneapolis. If shot in 2016, Twitter and the internet would be having heart palpitations. Where Purple Rain needs to work, it shines by walking a strange line between biopic and fiction, music video and cinema. 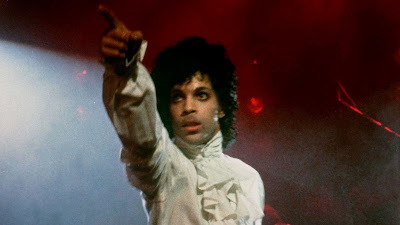 When you break down aspects of the movie it plays on its strengths and never loses site of its reason to exist, and that is to propel Prince to superstardom. The first surprise in the movie is Morris Day, who arguably steals some of the spotlight in this movie. Morris is an incredibly likable douchebag. At one point Morris and his sidekick Jerome throw a woman in a dumpster and I find myself forgiving it because he’s just so damned fun. His performance is only overshadowed (barely) by that of Prince and his character has these incredible moments where “Movie Morris” breaks character to become a very real and lieable person. But choices like these just add to weirdness of the movie. Everyone involved in the movie wants the audience to believe this is a true story, and injects enough truth that it becomes believable. During the filming of Purple Rain, Prince and Morris Day were actually at odds. Prince owned Morris Day and much of his music, an arrangement that started to go sour to the point that Morris Day had to get a ticket from a friend to attend the premiere. 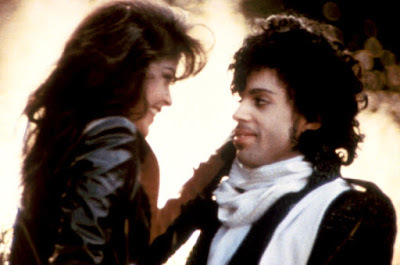 Purple Rain also blurs the line of truth with Prince and Apollonia’s relationship. Stories are that producers asked Apollonia to break up with then boyfriend David Lee Roth so that audience members would believe that Apollonia and Prince were really a couple. The movie is littered with truth to make it more believable. However, probably the most telling of Purple Rain’s intent on blurring reality lines and propelling Prince’s career resides in the choice to make his mother white and father black. In reality, Prince’s parents are both African-American, but in order to be at the top of the music industry Prince needed to appeal to white audiences. By making Prince the product of a mixed marriage, it makes Prince more appealing to white audiences and furthers the rumor and speculation created by the movie. It’s these small but deliberate choices that impress me almost more than what ends up on the screen. Through all the storylines, the thing that really is remarkable about Purple Rain is the music performances. Love or hate Prince, he is arguably one of the greatest performers of all time and Albert Magnoli knows it. Every single song on the Purple Rain album is featured in the movie and of the nine songs on the album, six of them are played and performed almost in their entirety. Add on two from Morris Day, one from Dez Dickerson and one from Apollonia, you end up with almost a third of Purple Rain essentially being a music video. Again, think about that in a modern context. While the idea of a movie where a third is music performances sounds dull, it carries the movie. I have found myself on occasion watching Purple Rain on cable and walking away during the plot, only to stop what I’m doing the second Morris or Prince picks up a microphone. Everyone involved in Purple Rain has just enough fingers to plug the holes and the movie is written and shot to play on its strengths. When faced with a lead that can’t act well, they write a script that doesn’t have him talk much. If the star doesn’t appeal to white rock fans, make his mother white and end it with a rock ballad. If the story gets dull, fill it with music. Everything about Purple Rain serves its purpose. Leading up to the release of the movie, Prince and The Revolution dropped the single "When Doves Cry," a song directly referencing the movie’s plot, and then a few weeks later released the full album. The single for "When Doves Cry" was a hit, reaching #1 on the charts, and the album for Purple Rain was the top album in the country. When the movie was eventually released at the end of July it was a hit. 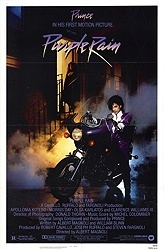 It spent a few weeks at number one and for a few weeks in the summer of 1984, Prince had the number one movie, single, and album in the country. For all the trouble that it has on paper, Purple Rain brought in $70 million on its initial $7 million budget. Touching on issues like family and sexism, it has a plot with enough appeal and substance to bring the audience to the next performance. The music both figuratively and as a plot point becomes an escape. Albert Magnoli, Prince and his producers took the idea of Thriller and successfully translated an entire album into a movie to propel a musician to superstardom. We will probably never see this again. With the way technology has transformed media, the type of ruse Purple Rain pulls on the audience would have trouble succeeding in 2016. With the record industry in the state it’s in, that leaves things up to Hollywood, and Hollywood would never take a risk on something as unproven as Purple Rain. There is a beauty in the risk and even more beauty in its success. It works in every measurable aspect of what it set out to do. It took a rookie director, two lead actors that never acted a script inspired by notes, a third of a movie as one long music video, and turned it into not only a successful movie, but one that is still beloved by millions -- all while accomplishing its singular goal of propelling Prince’s career. You don’t need to like Purple Rain, but it achieved something special, and should be remembered and appreciated for what it is. Thanks for all the behind the scenes insight. I love Purple Rain and knew nothing about those things. Great article! Thank you. There is a great book called "Let's go Crazy" all about the movie. A good read. If you had to pick a favorite song off the soundtrack...what would it be? That's so tough!! You realize that there were 5 singles off that album that all charted at different times?! I think back then, I would say Let's Go Crazy. Now? Probably I would Die 4 U or Darling Nikki. How can choose though...Baby I'm a Star would be my last choice. How about you? Ooooooo, Take me with you is amazing. I Would Die 4 U is my personal choice. The performance of Let's Go Crazy is outstanding and establishes a great tone for the movie. Man, do I love this movie. Morris Day and Jerome Benton do a jive version of "Who's on first?" that is comedy gold. Since we're talking favorite songs, may I put a good word in for "The Beautiful Ones"? A lovely song, and it works gangbusters as a seduction number. That is probably my favorite Prince performance in the movie. No joke, I went as Prince one year for Halloween and tried singing that for a girl I was trying to hook up with. I'm not Prince. I feel like this movie and soundtrack defined an entire semester of college for me. We (meaning everyone I knew at U of I) played it nonstop and went to see it multiple times. So many parties with everyone singing Let's Go Crazy and so many girls with poufy hair and lace gloves. We had LACE GLOVES, people. I think owning Purple Rain on vinyl was a requirement for renting a student apartment in Champaign in 1984. It was a force for good and I loved it so much. I am insanely jealous of this entire story. Nowadays the students at U of I are all about Jem and the Holograms. Wow - I am of course aware of the movie but knew next to nothing about it and have never really felt the need to watch it until now - do you think it holds up to a first time viewing in 2016? If it helps I love 80s movies unironically and think Prince is a genius. Great review man - SOLD! Thanks Sol! The performances are still top notch, to me the only thing that is really, really dated is the stuff between him and Apollonia.